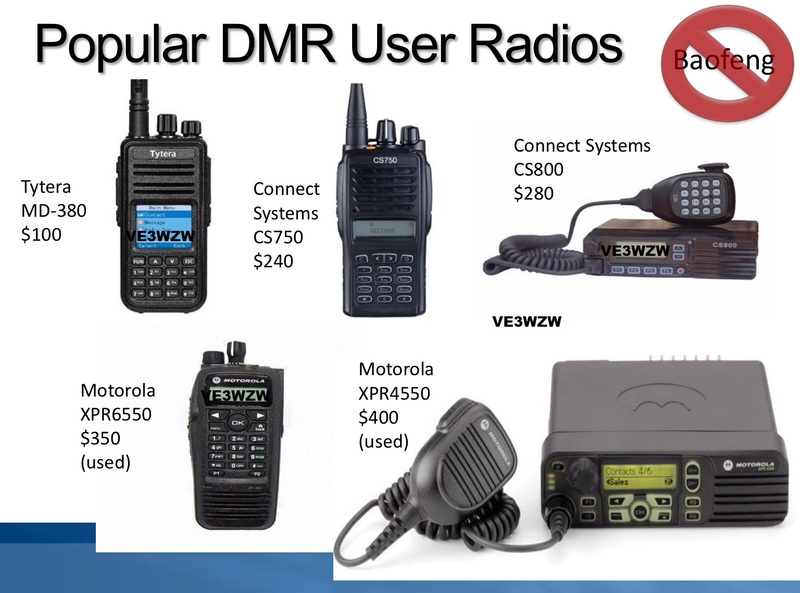 My name is Andre Vanier from Toronto Canada, I was tasked to offer my subjective comments about digital and the relation Digital Mobile Radio (DMR) aka MotoTrbo as it compares. 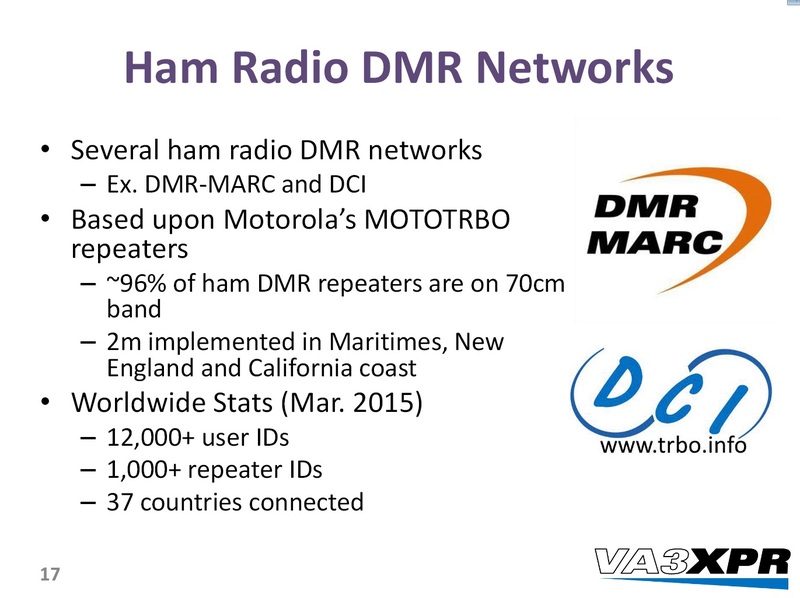 An overview of DMR and how it’s being adopted by hams all over the world, including a live demonstration of world wide communications using DMR. 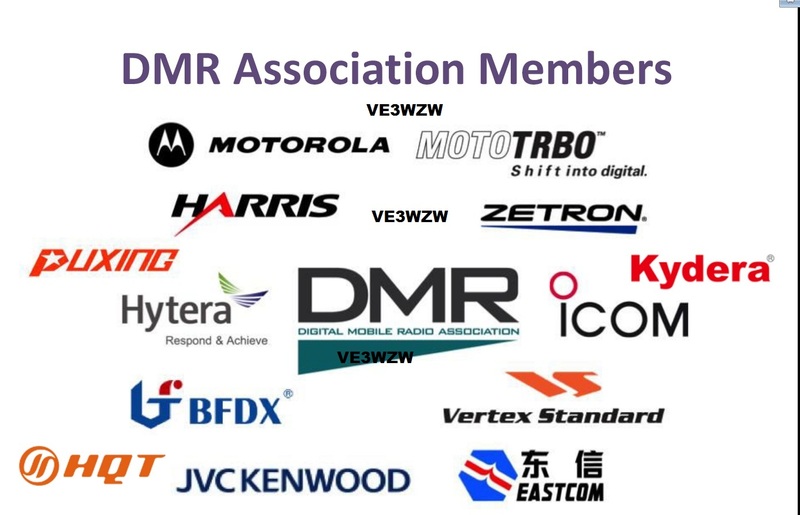 The presentation discussed the popularity of digital and the choices to select from ; ICOM-DStar, DMR(many), Yaesu Fusion C4FM, Kenwood/Icom NXDN NexEdge, APCO P25 to name but a few. Digital are not compatible with other digitals. 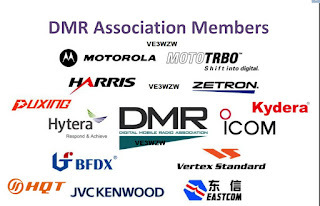 Different digital company do not connects/talks together. The lasting comments to the subject we had as a group. 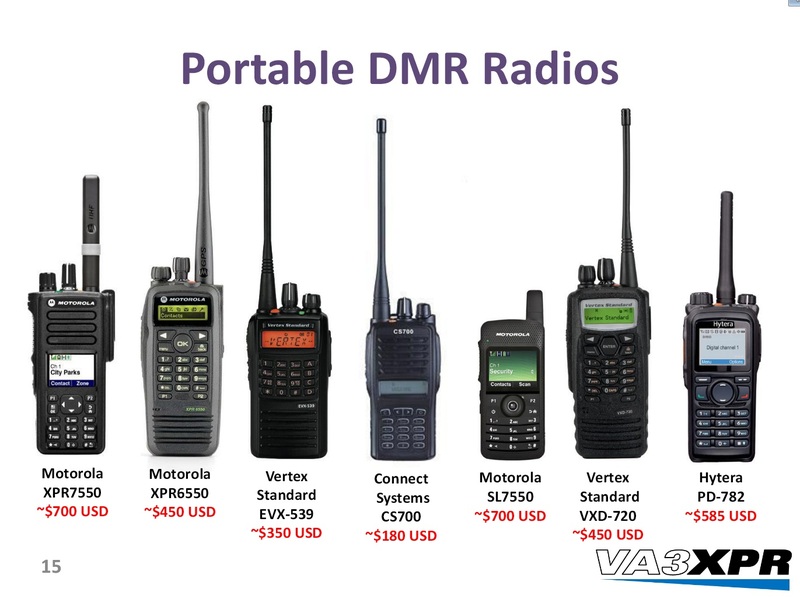 The affordability of the digital LMR (Land Mobile Radio) and a large selection of models from many manufacturers to choose, or select based on choices and features. 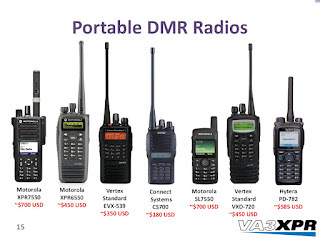 Digital Mobile Radio (DMR) aka MotoTrbo and many (20+) handheld or mobile models. 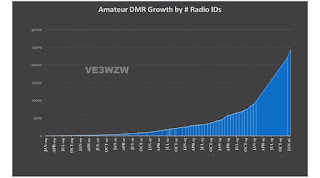 DMR+ has almost no following in the US. The primary users of that network now are almost all in Europe. 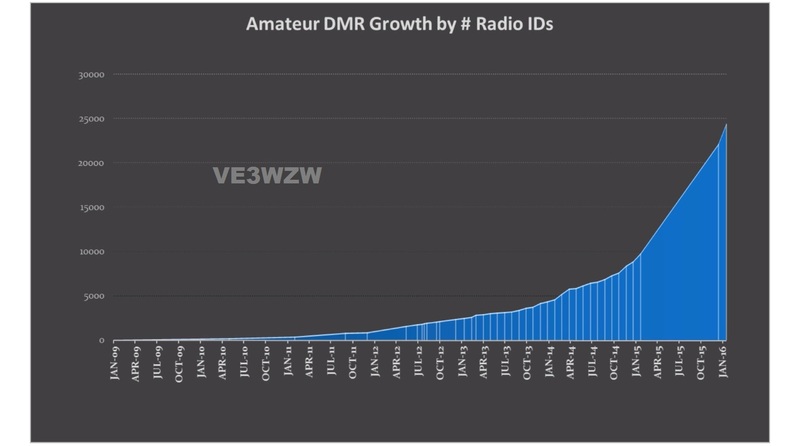 The growth for that digital or adoption rate, possibly considering why the increase by many consumers around the globe that may have adopted. To filter down in the subject of DMR and the system configuration file known as a codeplug. Considering when making a buying decisions a popular radio model as to have many friends or users to share that codeplug, why important so you may not have to spend many hours creating a new configuration file that might be freely and publicly shared. Each transceiver stores 1000 list ie.telephone-book know as a Contact-List with DMR user call signs that need to be updated often as new DMR users register. 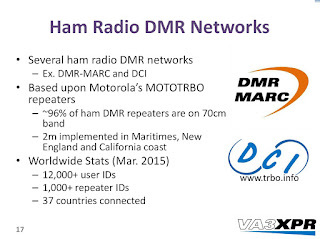 A Toronto HAM Don VA3XFT transceiver review website and repeater VA3XPR.net (Toronto DMR) owner and trustee. Included are numerous shared codeplug available for free download. Other devices that may require more attention or research are the "hotspots" A low power box connected RF to transceiver linked into the internet that give access into many modes Dstar,Fusion,DMR ; DV4mini, DVMEGA, SharkRF-OpenSPOT, MMDVM, BlueDV with DVMEGA and BlueStack. 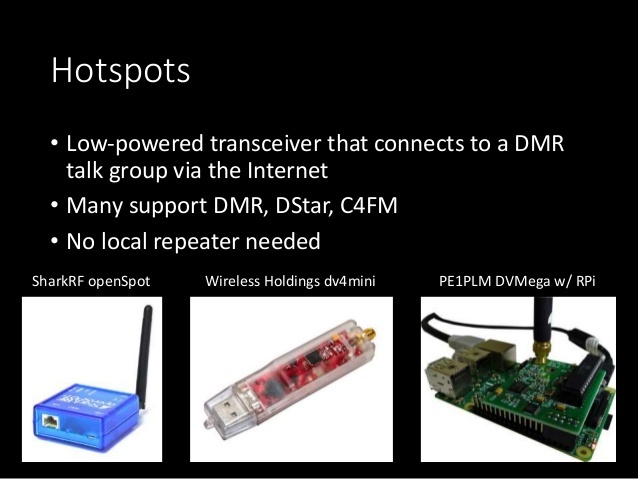 NA - live demonstration of world wide communications using DMR (underground NA).